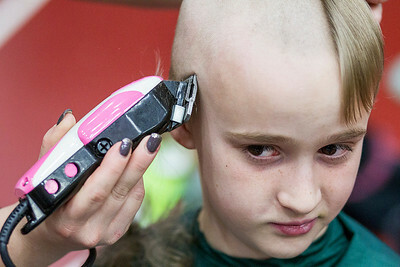 Kyle Grillot - kgrillot@shawmedia.com Valentina Luqueno, 6, of McHenry looks to her parents as she begins to have her head shaved participating in the McHenry Community Shave for St. Baldrick's Day in McHenry Thursday, March 13, 2014. 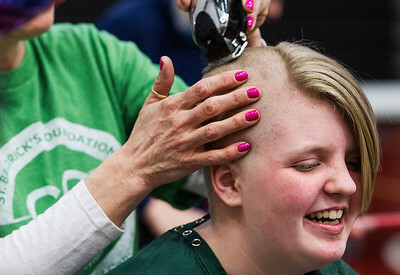 Over the past five years, McHenry East and West staff, students, and community members have had over 1900 heads shaved and raised over $489,000 for the St. Baldrick’s Foundation. Kyle Grillot - kgrillot@shawmedia.com Irene Puga of Woodstock reacts while she has her head shaved participating in the McHenry Community Shave for St. Baldrick's Day in McHenry Thursday, March 13, 2014. Over the past five years, McHenry East and West staff, students, and community members have had over 1900 heads shaved and raised over $489,000 for the St. Baldrick’s Foundation. Kyle Grillot - kgrillot@shawmedia.com Ethan O'Rourke, 10, of McHenry reacts as he has his head shaved participating in the McHenry Community Shave for St. Baldrick's Day in McHenry Thursday, March 13, 2014. O'Rourke raised $435 dollars for the event. Over the past five years, McHenry East and West staff, students, and community members have had over 1900 heads shaved and raised over $489,000 for the St. Baldrick’s Foundation. Kyle Grillot - kgrillot@shawmedia.com Marian Central sophomores Nora Tucker and Jay Cabusao hold hands while Tucker begins to have her head shaved participating in the McHenry Community Shave for St. Baldrick's Day in McHenry Thursday, March 13, 2014. 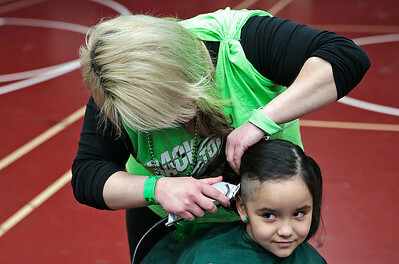 Over the past five years, McHenry East and West staff, students, and community members have had over 1900 heads shaved and raised over $489,000 for the St. Baldrick’s Foundation. 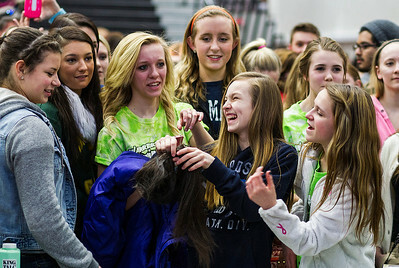 Kyle Grillot - kgrillot@shawmedia.com Spectators hold a lock of hair from Nora Tucker, 16, after having her head shaved participating in the McHenry Community Shave for St. Baldrick's Day in McHenry Thursday, March 13, 2014. Over the past five years, McHenry East and West staff, students, and community members have had over 1900 heads shaved and raised over $489,000 for the St. Baldrick’s Foundation. Kyle Grillot - kgrillot@shawmedia.com Emma Becker of Johnsburg has her head shaved participating in the McHenry Community Shave for St. Baldrick's Day in McHenry Thursday, March 13, 2014. Over the past five years, McHenry East and West staff, students, and community members have had over 1900 heads shaved and raised over $489,000 for the St. Baldrick’s Foundation. 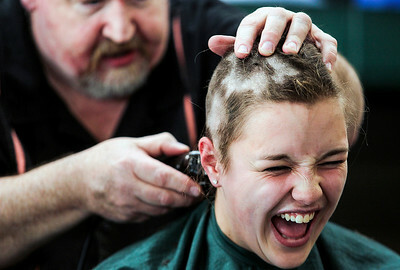 Kyle Grillot - kgrillot@shawmedia.com Marian Central sophomore Nora Tucker, 16, reacts as a friend holds a lock of her hair while she has her head shaved participating in the McHenry Community Shave for St. Baldrick's Day in McHenry Thursday, March 13, 2014. Over the past five years, McHenry East and West staff, students, and community members have had over 1900 heads shaved and raised over $489,000 for the St. Baldrick’s Foundation. 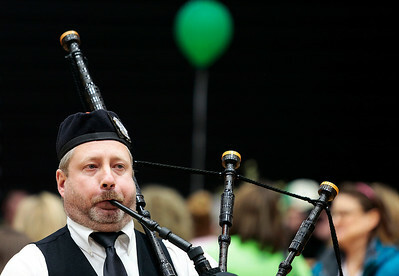 Kyle Grillot - kgrillot@shawmedia.com Wes Williams of the Dundee Scottish band performs at the McHenry Community Shave for St. Baldrick's Day in McHenry Thursday, March 13, 2014. Over the past five years, McHenry East and West staff, students, and community members have had over 1900 heads shaved and raised over $489,000 for the St. Baldrick’s Foundation. 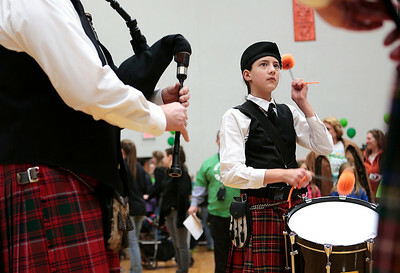 Kyle Grillot - kgrillot@shawmedia.com Olivia Williams, 13, of the Dundee Scottish band performs at the McHenry Community Shave for St. Baldrick's Day in McHenry Thursday, March 13, 2014. 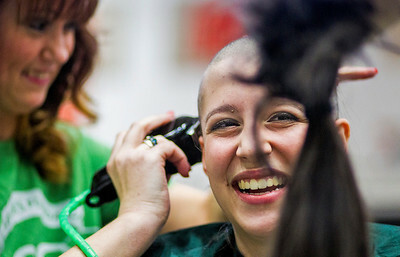 Over the past five years, McHenry East and West staff, students, and community members have had over 1900 heads shaved and raised over $489,000 for the St. Baldrick’s Foundation. Kyle Grillot - kgrillot@shawmedia.com Marian Central sophomore Nora Tucker, 16, looks to her friends as she begins to have her head shaved participating in the McHenry Community Shave for St. Baldrick's Day in McHenry Thursday, March 13, 2014. Over the past five years, McHenry East and West staff, students, and community members have had over 1900 heads shaved and raised over $489,000 for the St. Baldrick’s Foundation. 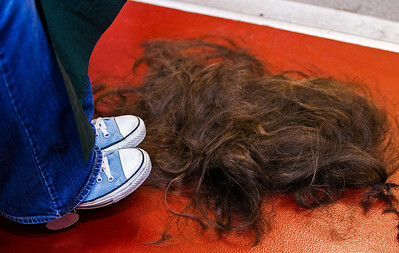 Kyle Grillot - kgrillot@shawmedia.com The hair of Melissa Murgalroyd of McHenry rests at her feet after her head shaved participating in the McHenry Community Shave for St. Baldrick's Day in McHenry Thursday, March 13, 2014. Over the past five years, McHenry East and West staff, students, and community members have had over 1900 heads shaved and raised over $489,000 for the St. Baldrick’s Foundation. Sarah Nader- snader@shawmedia.com Sarah Richter, 17, of Lake in the Hills has her head shaved while participating in the Crystal Lake South Kiwanis 'KEY CLUB' ShaveAthon for St. Baldrick's Day in Crystal Lake Thursday, March 13, 2014. 44 students and facility raised over $10,000 for childhood cancer research at the event. 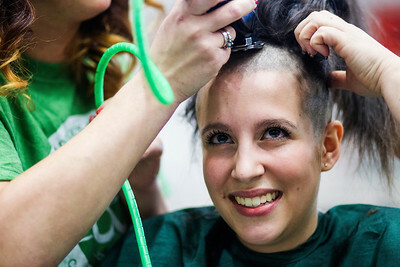 Sarah Nader- snader@shawmedia.com Maggie Cronin, 16, of Crystal Lake takes a peak at herself after having her head saved while participating in the Crystal Lake South Kiwanis 'KEY CLUB' ShaveAthon for St. Baldrick's Day in Crystal Lake Thursday, March 13, 2014. 44 students and facility raised over $10,000 for childhood cancer research. Cronin raised $1,940. 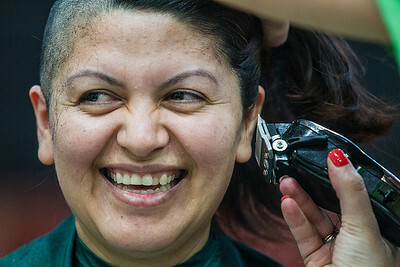 Sarah Nader- snader@shawmedia.com Long hair is put aside to be donated during the Crystal Lake South Kiwanis 'KEY CLUB' ShaveAthon for St. Baldrick's Day in Crystal Lake Thursday, March 13, 2014. 44 students and facility raised over $10,000 for childhood cancer research at the event. 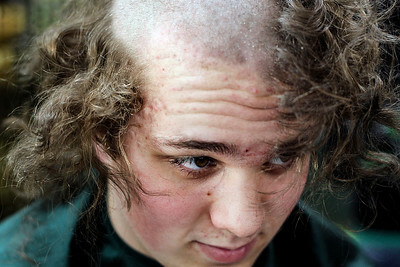 Sarah Nader- snader@shawmedia.com Sean Frank, 17, of Crystal Lake has his head shaved while participating in the Crystal Lake South Kiwanis 'KEY CLUB' ShaveAthon for St. Baldrick's Day in Crystal Lake Thursday, March 13, 2014. 44 students and facility raised over $10,000 for childhood cancer research at the event. 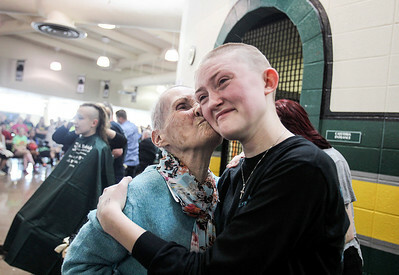 Sarah Nader- snader@shawmedia.com Lynne Irving (left) of Markham, Ontario kisses her granddaughter, Kristin Knudsen, 17, of Crystal Lake after she participated in the Crystal Lake South Kiwanis 'KEY CLUB' ShaveAthon for St. Baldrick's Day in Crystal Lake Thursday, March 13, 2014. 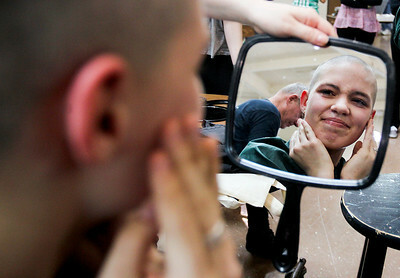 Knudsen shaved her head for her grandmother, who has been battling ovarian cancer for three years. 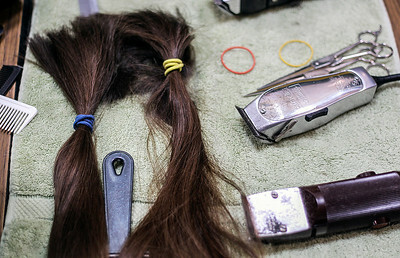 She raised over $1650 for childhood cancer research. 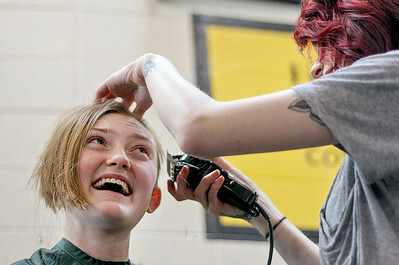 Sarah Nader- snader@shawmedia.com Kristin Knudsen, 17, of Crystal Lake has her head shaved while participating in the Crystal Lake South Kiwanis 'KEY CLUB' ShaveAthon for St. Baldrick's Day in Crystal Lake Thursday, March 13, 2014. 44 students and facility raised over $10,000 for childhood cancer research at the event. Knudsen raised over $1600. 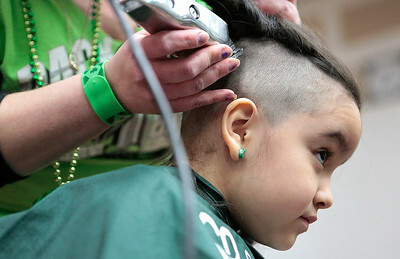 Valentina Luqueno, 6, of McHenry looks to her parents as she begins to have her head shaved participating in the McHenry Community Shave for St. Baldrick's Day in McHenry Thursday, March 13, 2014. Over the past five years, McHenry East and West staff, students, and community members have had over 1900 heads shaved and raised over $489,000 for the St. Baldrick’s Foundation.